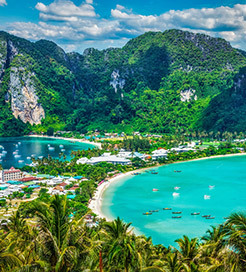 With Directferries.co.uk you’ll find the full selection of Ferries to Phi Phi Island with the best ferry companies ensuring you find the most suitable option. We currently offer ferries to Phi Phi Island on around 15 ferry routes with a choice of up to 301 sailings weekly. Find ferry timetables and prices for your ferry crossing to Phi Phi Island by selecting your preferred route from the fare search, number of passengers, and then click search. For more information, please visit our Ferries from Thailand to Phi Phi Island page. For more information, please visit our Ferries from Langkawi Island to Phi Phi Island page. For more information, please visit our Ferries from Langkawi to Phi Phi Island page. For more information, please visit our Ferries from Phuket Island to Phi Phi Island page.